The first-ever Beer and Music Festival in Spalding is to take place later this year. The event at The Castle Sports Complex is being jointly run by Spalding and District Round Table and Spalding Ladies’ Circle. About 50 real ales will be on offer plus live bands, food stalls and attractions for children. Round Table chairman Sam Nundy said: “The Spalding Round Table family (including Ladies’ Circle), supported by several local businesses and individuals, is very proud to be able to say that we will be hosting the first Beer and Music Festival. “Our national motto for Round Table is ‘Do More’ and we are trying to live up to this by hosting what we hope will become a well-loved annual event that local people enjoy. Musician Mark Le Sage and The Priors Oven landlord Charlie Rawlings are helping to put together the festival, which will run between Friday, May 27, and Sunday, May 29. Adult admission will be £3 per day or £5 for a weekend wristband. Entry for anyone aged 7-17 is £1 and under-sevens go free. Under-18s will only be allowed entry with an accompanying adult. Spalding Round Table is looking for a main sponsor for the event. Each beer keg is also available to sponsor by a business for £100. Contact Sam on 07775 796120. 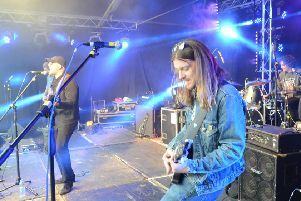 Eighties tribute band The Wild Boys are headlining on the Friday night and local rock bands Revolver and Loose Rocket are due to play on Saturday night. Artists must be able to supply an audition in a format such as a CD, MP3 file or website. Contact Mark by email at pepmls@aol.com or call 07961 521727.